Chautauqua offers a new water park, playgrounds, picnic shelters, free camping, tennis courts, disc golf. There is also a free-span steel foot bridge that crosses the river to additional open space on the north side. The beautiful Solomon River is accessible in several areas throughout the park as it wraps around the entire area; a boat ramp is available for small fishing boats. ​Chautauqua Swimming Pool Water Park – features a leisure pool, zero depth entry, diving boards, slides and a lazy river. It’s fun for all ages! Camping facilities can be used free for up to 10 days in any 60 day period and offer 30 electric & water hook-ups, and a sewer dump station. 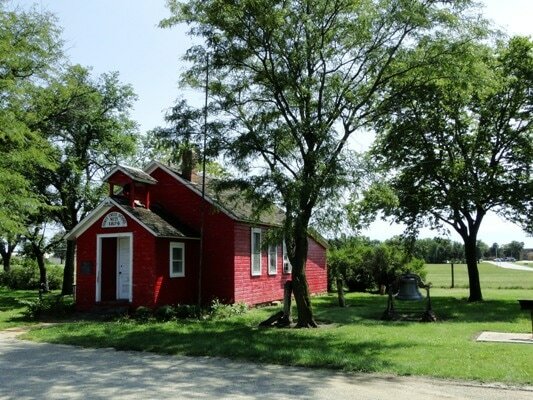 Located just off U.S Hwy 24 Roadside Park is home to The Little Red School House, a local historic landmark. This 2-acre park is a great spot to take a break from a long journey and enjoy some shade while sipping on a drink from one of the nearby restaurants just across the highway. Open every Wednesday (4pm-6pm) taking place between Memorial Day weekend and Labor Day Weekend. Fresh Produce, breads, homemade soaps, buffalo meat, crafts and handiwork, jams & jellys, farm eggs and a whole lot more!!! Following the closure of the Beloit Correctional Facility, the Kansas legislature donated the grounds and buildings back to the City of Beloit. The Beloit City Council approved a proposal from the Parks and Recreation Director to use a portion of the land for the community garden. The Community Garden Committee was formed to give direction to the project. ​The garden is an allotment garden with a sliding scale for plot fees for individuals or families who can;t afford fees. The goals of the garden are to utilize the idle land; provide plots for those that do not have an area for gardening; enable individuals with limited incomes to grow their own food; provide a teaching venue from groups such as day care children and special needs audiences; provide excess produce to the local food pantry and senior citizens; and encourage exercise, socialization and production of nutritious food. This 4-acre park has a variety of facilities that make a perfect place for any age to visit. A 1/3-acre park located just north of the Municipal Building at 2nd & Hersey. This park is a small garden-type park designed for viewing and relaxing. The park has a small gazebo, several limestone benches and a beautiful fountain.